Albino Lullaby is an interesting title. It's a first person horror game adventure, that promises no jump scares! That's great for people like me, who enjoy horror games, but not the jump scares. Mechanically Albino Lullaby is a pretty simple game. Walk around taking in the sights, collecting notes, and try not to get creeped out too much. Later on the game will introduce some minor stealth and combat mechanics as well. The game is really a lot more about the experience of it's atmosphere and story much more than it's mechanics. The game's visuals is probably one the high points for Albino Lullaby. The textures have this pencil sketch look to it, the environments and characters are both beautiful and creepy at the same time. The game utilizes Unreal 4's engine for some pretty impressive lighting and rendering. The visuals are complimented by it's audio, with creepy background noises, subtle musical cues, and impressive voice acting. The game's presentation is spot on with what it's trying to achieve. Though I certainly enjoyed the game greatly, it's not with out it's faults. My number one compliant has to be it's performance. Though the beginning half of the game runs relatively well with above 60FPS consistently, the second half is mired with tons of frame drops. The end part of episode 1 is so bad, that my frames dipped below 10FPS and I couldn't finish it because it was just torturous to put myself through it. The game also suffers a bit from poor difficulty scaling. The first half was mostly a "walking simulator" but the game all of a sudden injects such a challenge level, that I went from a relaxing (albeit creepy) walk in the park, to having to restart a section a half dozen or more times, then it teeters off back to easy mode. These are my biggest complaints about the game. The difficulty scaling didn't mire my experience too much, but the performance issues prevented me from completing the first episode. It should go with out saying, it definitely impacted my experience negatively. Luckily for us, performance issues can be patched out, and hopefully it will be in the near future. 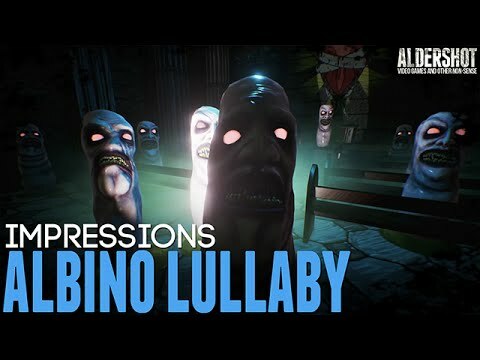 Overall Albino Lullaby is an episodic game that seem to have a ton of potential. It's gorgeous in it's visuals, creepy in it's atmosphere, and features some damn good voice acting and dialog. It's really too bad about the performance issues, but at the time of this impression, it is a major negative factor. Luckily, I still found a lot of enjoyment out of Albino Lullaby. Here's hoping for some optimization patches soon.